The main excitement today at the Tradd Street Redan dig was the extraction of large objects with the help of the track-hoe. We brought some great historic materials back from the past for viewing, but we also started the clock ticking on the question of the long-term conservation of these materials. For the past week or so I’ve posted images of a large mass of bricks resting in the mud adjacent to the south face of the redan. At first we thought of this object, which is roughly 13 inches wide and about three feet broad, as a fragment of the upper part of the old wall. Perhaps the wall was very skinny at the top, we thought. 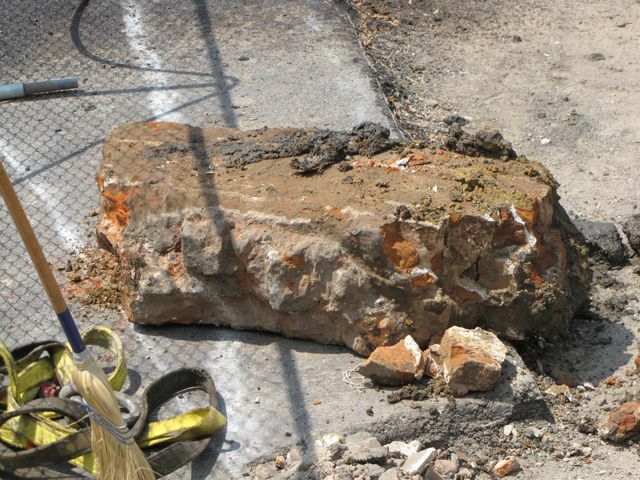 After reviewing my research notes, however, I now believe this brick mass represents an early manifestation of the above-ground seawall, which, according to legislative reports of the 1740s and 1750s, consisted of a “double brick wall filled with mud” prior to its being rebuilt as a solid brick wall after the massive hurricane of 1752. 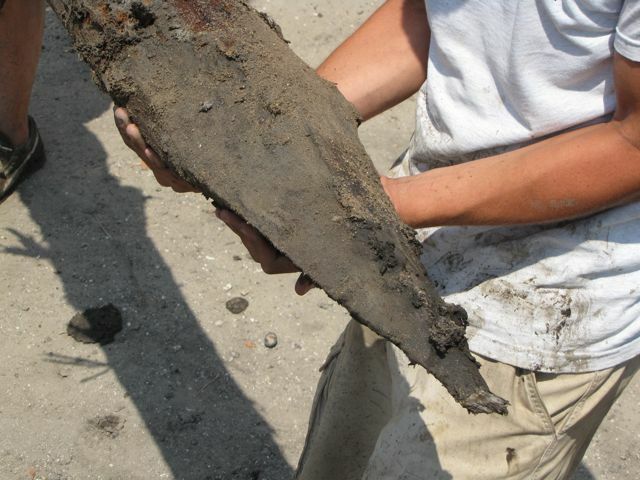 Our large fragment, seen above being extracted by the track-hoe and then sitting on the asphalt, may therefore represent the thin outer surface of the pre-1752 redan wall. Earlier this week I reported the presence of several wooden piles situated in a line parallel to the south face of the redan at a distance of five feet from the wall. We were overjoyed to see these posts, which, when back-filled with oyster shells and mud, once formed a sort of breakwater to protect the brickwork from violent tides and rogue ships. 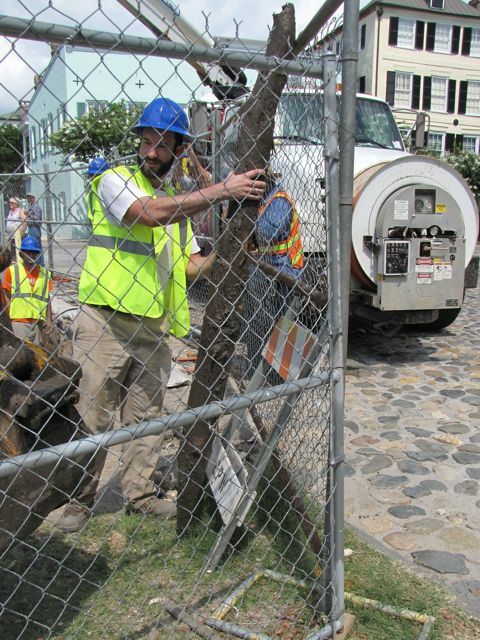 The documentary record tells us these pilings, which extended across the entire length of Charleston’s waterfront, were nearly all “carried away” by the hurricane of September 1700 and then replaced in 1702–1703. 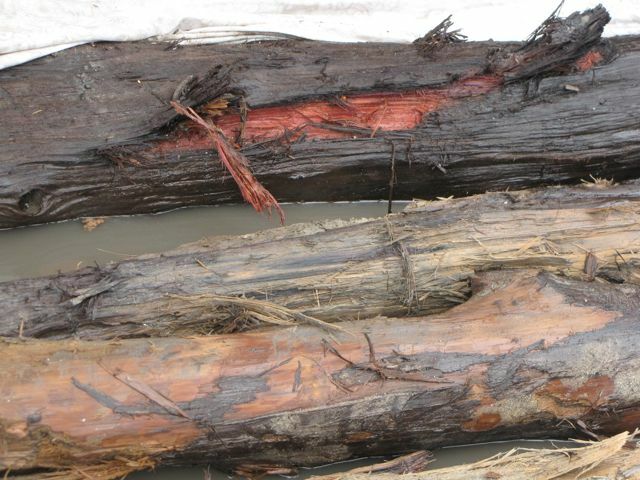 At some point later in the eighteenth-century the waterfront piles were completely covered over by silt, sediment, and trash, but with some effort and patience the crew managed to extract a total of nine wooden piles from the historic mud. The first couple of piles were so firmly embedded in the mud that they could be extracted only with the help of a strap attached to the track-hoe bucket. After the initial piles were out of the mud, the remaining ones came out with less trouble. At left is Brockington and Associates archaeologist Andrew Agha standing with the first of the piles. Soon we had several piles, well, piling up at the edge of the pit, still covered with mud (see photo below right). Immediately the several professional archaeologists on hand realized that they needed to begin to protect these 300-year-old organic objects from being damaged by exposure. Remember that they’ve been soaking in water, protected from everything, including oxygen, for more than 200 years. Loose ballast stones (extracted today from the same mud) were quickly gathered and arranged into long rectangles on the ground, then covered with plastic sheeting. One by one the water-logged timbers were placed in these makeshift baths, rinsed with a hose, and covered with water (see the photo at left). 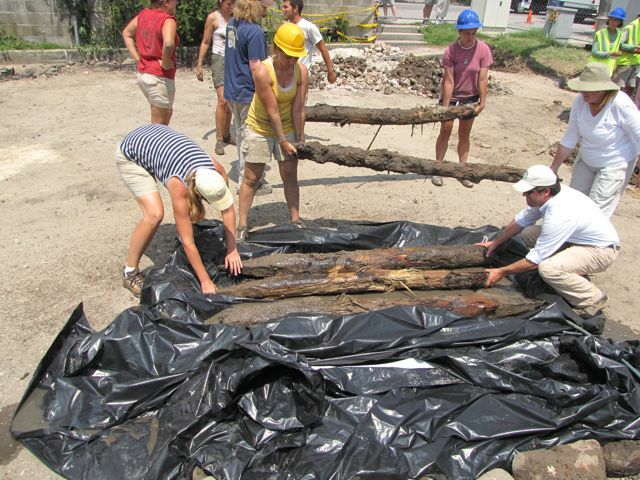 Once that frantic activity was accomplished the archaeologists and College of Charleston archaeology students began studying and measuring them. I can mention three significant features about these piles. First, they’re all roughly seven feet in length and just over a foot in circumference. Second, their bottom ends have been shaped with an ax into a crude but effective point, as seen in the photo above center. Third, the majority of the nine piles we recovered today are native cypress timbers, as you can see in the photo above right left of the newly-rinsed piles soaking in their protective shallow bath. In this same photo, however, you can clearly see that the pile at the top of the image is red cedar. Even after 300 years, they still look nearly as fresh as when they were harvested from a local forest. Which brings us to our final point of the day. These wooden piles are precious historic objects that tangibly connect us to Charleston’s distant past, but they’re also composed of organic materials that will rapidly decay now that they have been removed from their “home.” The several professional archaeologists on hand today talked amongst themselves in an effort to make some decisions about the future of these piles, and also consulted with visiting conservation experts from the Hunley conservation laboratory. The short answer is this: It will cost several thousands of dollars to conserve the piles—perhaps as much as $10,000 for permanent conservation of two of the nine extracted from the colonial-era mud today. 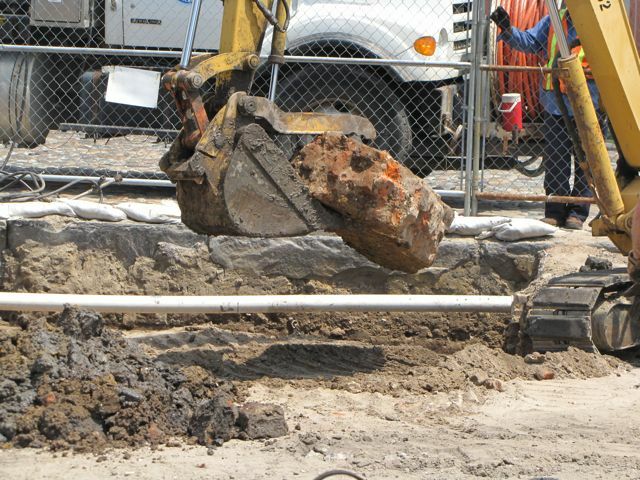 By Friday morning, June 26th, we will have to decide whether to put some or all of the piles back in the pit to be reburied, or to keep only one or two to be conserved and displayed at the Charleston Museum. Money is scarce all around for such projects, but we hope some folks in the community will lend some financial assistance in this matter. I think this is a wonderful opportunity for anyone passionate about Charleston history to pitch in and help preserve part of this city’s storied past for future generations. 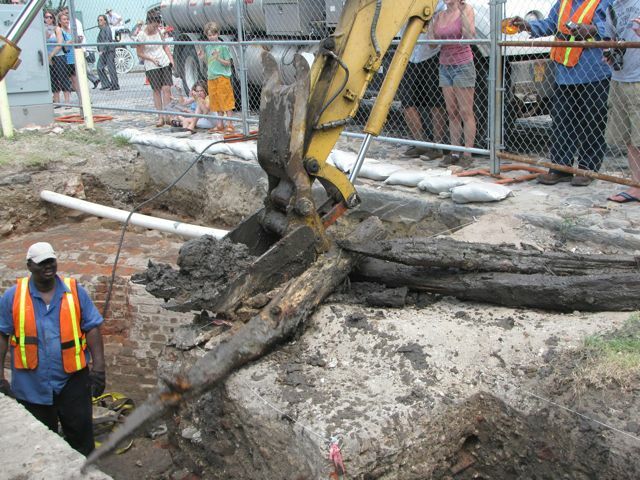 Why not consider “adopting” a wooden pile from Charleston’s colonial waterfront. These silent piles once witnessed the arrival of pirates, African slaves, and optimistic European immigrants, and it would be a shame to lose this opportunity to pass them forward to inspire future Charlestonians and visitors alike. 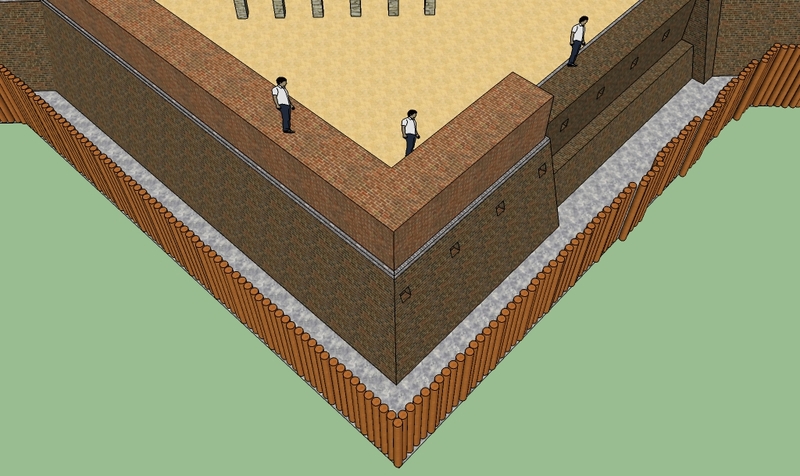 If you’re interested in helping the Walled City Task Force turn this idea into a reality, please email Katherine Saunders, co-chair of the Task Force, at ksaunders[at] historiccharleston.org, or call her at (843) 723-3646. This window of opportunity will end Friday morning, so we must act quickly! The June 30 presentation will be great! ‘Better set up extra chairs! Yes, _very_ exciting, and I feel luck to have been involved. We have seating in the Charleston County Public Library’s auditorium for about 200, so I hope we do have a full house!